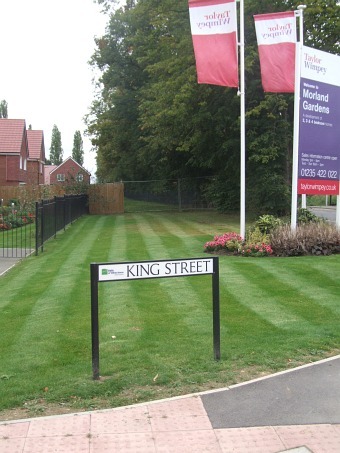 To commemorate the town’s first loss of the Great War a road in the new Morland Gardens development has been named after Private Percival Arthur King. On the tenth of September, 1914, the people of Abingdon mourned their first loss of the Great War. 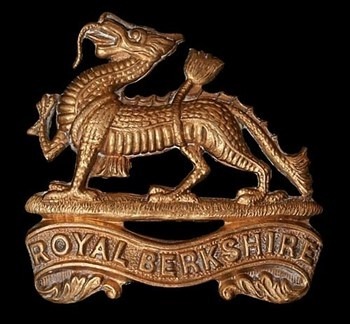 Private Percival Arthur King of court 22, Ock street, was killed in action taking part in the first Battle of Mons while serving with the 1st Royal Berkshire Regiment, British Expeditionary Force. 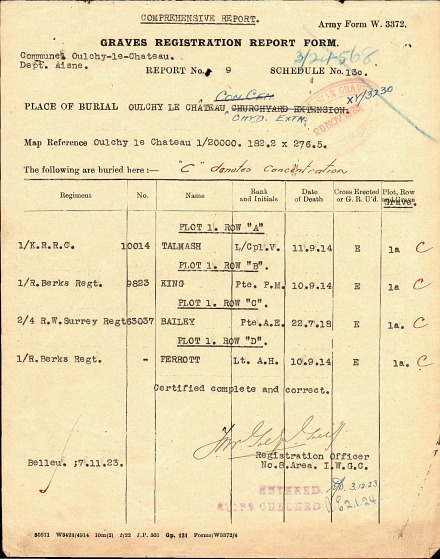 Entry: 6th Bde A.G. to 2nd Div. Battalion with 1 sect 36 Bde RFA and 1 sect of 2 Fd Co R.E. as vanguard. Hostile column early seen [sic]. Some doubt as to identity. Touch obtained at village of HAUTEVESNES. On passing village of St GUNGOULPH, Germans estimated one Battn and 4 guns took defensive position assunder road. 1/Kings Rgt and 1/K.R.R.C. deployed to left of vanguard. 1. Bt 5th Bgd moved up in support on right. NE position captured 12.45pm. Went about to deploy for further action against hostile artillery. Heavy shell fire from left. March continued at 4.45pm. Bivouac at 6.30pm at CHEVILLAN. 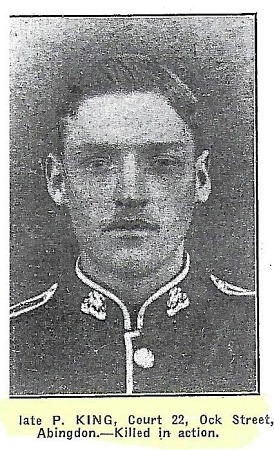 Casualties Lt A. H Perrott and 1 other rank killed. Other ranks 23 wounded. 365 prisoners and 546 rifles captured. 57 dead buried. The warm weather came and went again. While it lasted the flowers in the town centre looked even more vibrant. With blooms like this you can forget almost that the hotel behind is still boarded up. 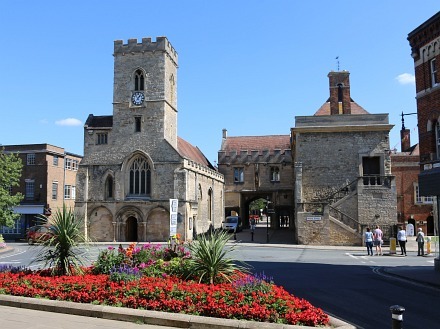 By the way as part of Heritage Open Day “Tours of the Guildhall will take place at 10:00, 11:00 and 12:00 on Saturday 9th September. 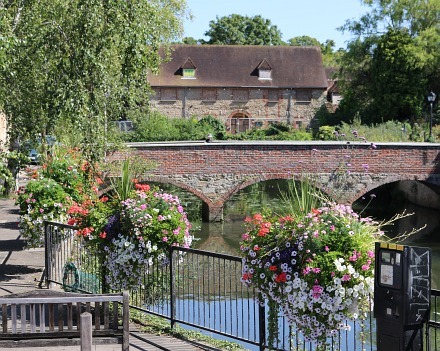 Places are limited so you are advised to book by e-mailing enquiries@abingdon.gov.uk.” There will also be an exhibition from 10 am this Saturday called ‘Made in Abingdon’ at the Community FreeSpace, opposite H Samuel. Two weeks ago, The Thames Valley Croquet Club held their annual Ladies Day Golf Croquet tournament at their grounds in Hales Meadow, Abingdon. The tournament was well attended. Participants coming from the Isle of Wight, Dorset, Oxfordshire and surrounding counties. Competition was fierce, and for the first time the winners and runners-up were from the host club. A very good day was had by all. 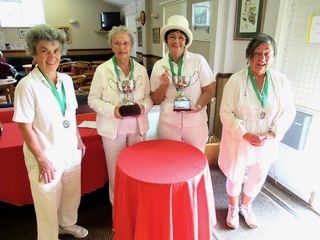 Last week the winners of our tournament went to Taunton to compete in the Women’s Institute Inter-federation Golf Croquet tournament and came out on top to win that tournament also. The club is looking for new faces, of both sexes, of all abilities, from absolute beginners to previous players, and all ages. So why not come along and give us a try. We play throughout the year, on Mondays and Fridays 1.30pm – 4.30pm in the Summer and 11am – 2.30pm in Winter. Membership fees are modest. 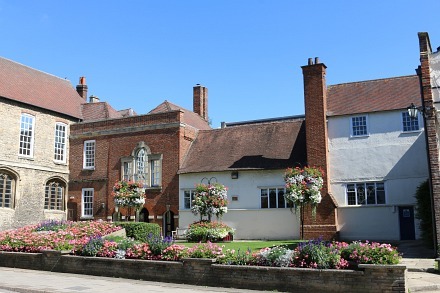 Our courts are within the Abingdon Vale Cricket Club grounds, Hales Meadow, Culham Road, Abingdon. If you have never played before we will happily give coaching. We are a friendly bunch and you will be made very welcome. Enjoy some fresh air, gentle exercise and give the grey matter a workout! For more details, please give Mike a ring on 01235203082 or drop in to the Club and make yourself known. P.S Golf Croquet has simpler rules than Association Croquet (each turn is just a single stroke), but it requires a similar level of accuracy and tactical awareness. 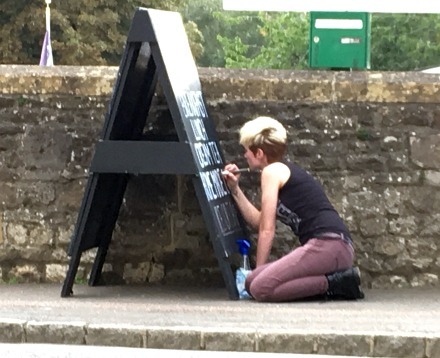 On Friday, Ashley sent me a picture of a new sign being painted on Abingdon Bridge. The old chandlery has been improved, new floors laid, handmade blinds added, a kitchen installed and furniture added. There is seating inside, and an extended seating area outside. 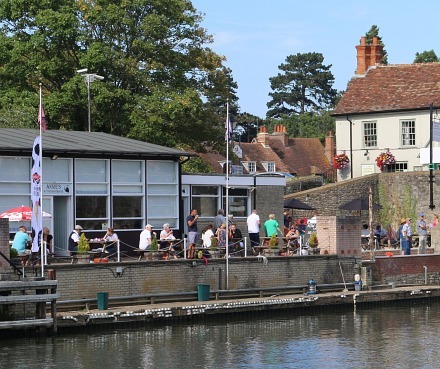 Annie’s on the bridge is a new extension of Annie’s Team Room on the Oxford canal at Thrupp. They are open throughout the year from 10am to 5pm, and have a dedicated web page at http://www.anniestearoom.co.uk/Boathouse.htm. On visiting Abingon Lock today we saw the Esme Dowling shield. Richard Hawkin, and Frank Jordan have been awarded the prestigious Lock Keeper of the Year award for Abingon Lock. There was a big presentation a couple of weeks ago. 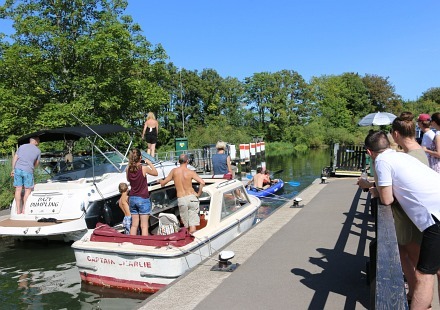 At Abingon Lock a lot of boats were passing through the lock gates on the hottest day since the start of the school summer holidays. 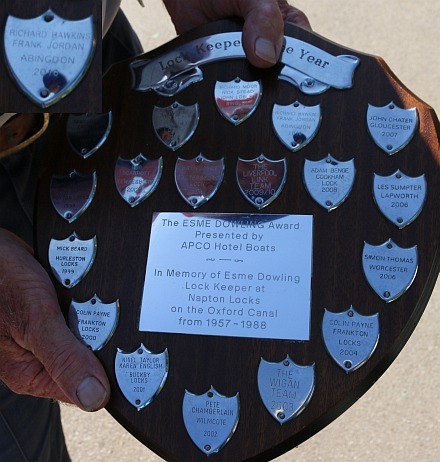 The Esme Dowling Award for Lock Keeper of the Year is voted for by members of APCO Hotelboats. 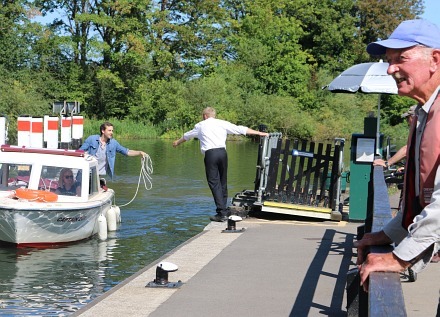 The award is for outstanding customer care and performance and is open to all lock keepers on the UKs inland waterways.